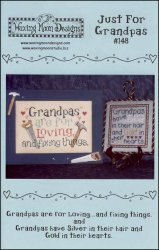 Just For Grandpas [H5242] - $8.00 : Yarn Tree, Your wholesale source for cross stitch supplies. Cross stitch pattern by Waxing Moon Designs. Two designs for Grandpas. Grandpas are for Loving: 83 long x 129 wide. Silver & Gold: 85 long x 79 wide.